* Special thanks to Judd from Fleet Feet Sports Hartford. It's been a techie season. Fitness and life-trackers are giving people motivation to get moving, and showing how active their lifestyle is. Smartwatches are all the rage for productive people trying to stay connected, avoiding the inconvenience of checking your phone every 30 seconds (we've all been there). Running watches are getting ever more convenient and helpful in training for the next big race. Buying a separate watch for every different activity in your life is expensive and inconvenient, since they all require charging. It would be awesome to have a simple device that does all of this, right? Garmin thought so, too. The Garmin VivoActive watch does....everything. It is a small, stylish watch (you can buy separate wrist-bands, including a leather one! ), that keeps track of everything you do. It has Smartwatch capabilities, like informing you when and who is calling/texting/emailing you. There are downloadable apps for custom watch-faces, weather, and calendar, along with the fitness-tracking capabilities that remind you when you need to move and walk around. All aided by a really easy to use touch-screen interface. Pretty cool, but other watches have that, right? The thing that sets the VivoActive apart is the stuff Garmin has been known for, and a market leader in: standalone GPS watches. In the Apps section, you have options for almost any activity Garmin makes a product for. 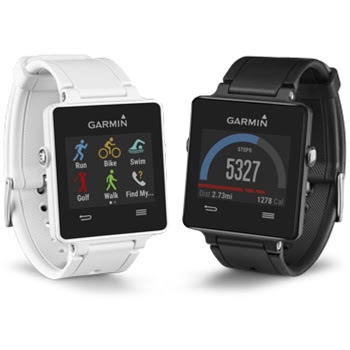 The big ones are run, bike, and swim functions (yes, you can swim with it), but since Garmin was making a mini-computer for your wrist, they gave it other capabilities, like golf, tennis, rowing, or even keeping track of where you parked! Out of all of the watches on the market, whether you're looking for a life-tracker, stylish, smart, or athletic, the Garmin VivoActive does... everything, and well!